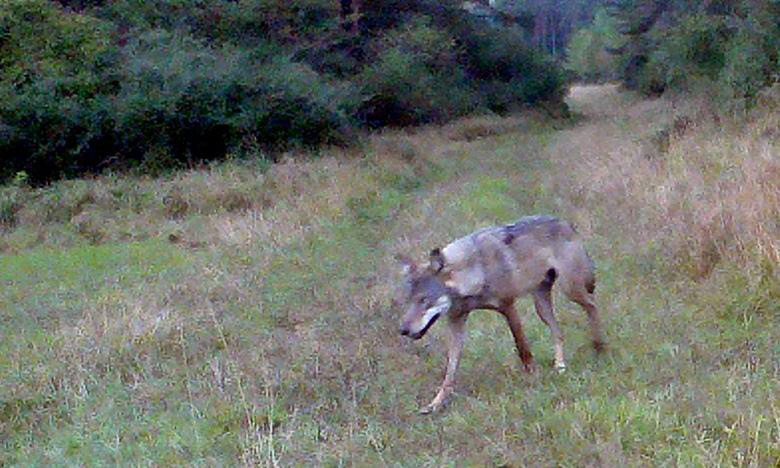 Wolf photographed with a trail camera in the Grafenwoehr Training Area Sept. 5, 2016. Photo courtesy of Federal Forest Service Grafenwoehr. GRAFENWOEHR, Germany — A wolf was spotted in the Grafenwoehr Training Area a few months ago by a federal forester and photographed by a German Federal Forest Service wildlife camera. Wolf sightings were reported September 2016 in the expansive training area of Grafenwoehr, prompting immediate garrison response measures. No injuries or contact were reported, but community members are reminded to remain calm and stay clear of all wildlife. Wolves once lived throughout the entire northern hemisphere. Seen as a threat to people and livestock, they were hunted mercilessly in Europe. Germany was wolf free by the end of the 19th century. In the late 1990s, however, wolves started to wander back into Germany from Poland and have since inhabited the northeastern part of Germany. Germany’s Federal Agency for Nature Conservation recently announced that numbers from April 2016 indicate that 46 packs, 15 pairs and 4 sedentary individuals reside in Germany — primarily in the states of Saxony, Brandenburg and Lower Saxony. Since 2006, numerous wolves have been spotted by wildlife cameras or found dead by the side of the road throughout parts of Bavaria. These wolves are likely young males from northeastern Germany or the Alps searching for new territories to call their own. At this time, no pairs or packs have been reported in our area. This time around, wolves are viewed differently. While wolves still need to be heeded with caution, they are now seen by many as necessary to maintaining a balanced natural environment. Wolves are protected by nature protection laws in Germany and many other European countries, and it is prohibited for people to harm or kill them. That does not mean, however, that they are not actively managed. Numerous German official authorities and non-government organizations take great lengths to monitor German wolf populations, help prevent wolf livestock encounters and educate the public about the return of wolves. Wolves are intelligent, social animals. They prefer to live in packs, which are composed of a breeding pair and their offspring from the current and previous year’s litters. In years when food is plentiful, pairs give birth to four to six pups. Pups reach maturity around two years of age. This is when young wolves leave their pack to find a partner and their own territory. Sometimes young males travel several hundred miles. Each pack has their own territory with the average size ranging from 58 to 135 square miles depending on food availability. Wolves can influence the ecological balance between herbivore populations and plant communities. In Germany, wolves’ natural diets vary from mice to roe deer, wild boars, hares and red deer — or even carrion. Since the renewed presence of wolves in Germany, no attacks on humans have been reported. Wolves are naturally cautious and try to avoid humans. Opportunistic eaters, wolves eat whatever is most easily accessible, such as boar and deer — both of which are abundant in the Grafenwoehr Training Area. Conflicts can arise when wolves have easy access to unprotected livestock and trash. “There are a few things we can do to ensure we live in harmony with wolves and other wildlife,” says Environmental Division’s Stefan Haertl. Soldiers and people out in the training areas can help by properly disposing of food wastes or wrappers and not feeding wildlife or stray animals. For those living on or off post, Haertl recommends securing pet food. Leaving pet food unattended on the porch or patio can attract wildlife and stray animals. Wildlife, such as wolves and foxes, might start to associate humans or human facilities with food and lose that natural timidity, possibly leading to dangerous situations. Do not run away. Do back away slowly and calmly if you feel you are too close. Do attract attention to yourself. Talk loudly and gesture to make yourself noticeable. Do not run after the wolf. It could see this as aggression and attempt to defend itself. Do put a leash on your dog and keep it close at hand.